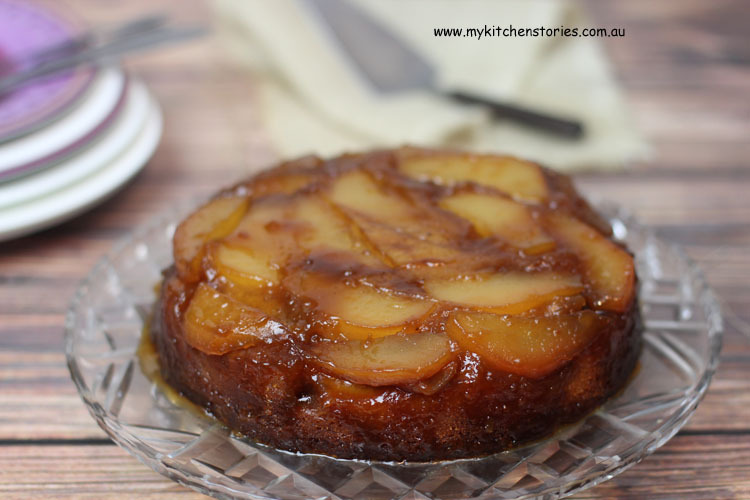 Doesn’t this Pear Salted caramel and Beer cake look amazing?. It really is as delicious as it looks. It is Spring and that means a lot of creatures big and small come out to enjoy the balmy nights. That’s also when we humans throw caution to the wind and wander about without shoes on darkened cooling grass….and strike trouble. I have been suffering from a very painful shoulder that has a little bit of restricted movement and when I lift my arm above my head there is intense pain. When I move it quickly or bump it I turn into a ridiculous blubbering idiot. On a recently new warm spring night with the promising scent of a voluptuously flowering Jasmine bush in the air, I stepped off the verandas and straight into a sticky groping spider web whose occupant was just as surprised as I was. I am just a little petrified of Spiders and the blood curdling scream coupled with my flailing arms and then my anguished weeping whist still swearing at the top of my lungs brought Skater from the house. He saw that I was both in agony and petrified with terror and all I could do was yell get it off…. get it off….. He pulled me into the light and checked me over, looking for any Spider silly enough to be still attached, then lead me into the house. He even asked if I wanted a cup of tea. I had walked straight into the huge web with a round fat bodied Spider in the middle at about my neck level. The poor Spider had no opportunity to run and I felt it swing into my neck with web wrapped around my ears before it could even run. My hand grabbed it off my neck and flung it with such force it almost pulled my sore arm out of its socket. In the panic I didn’t know if it was gone I was in so much pain I wasn’t sure if I was screaming or if it was someone else. Skater tells me with the eyes of a reliable witness that I was throwing my arms all over the place and screaming. I will never forget the feel of that fat little body on my neck. My arm was probably damaged a little more in that moment. I lived through it but I still have nightmares about the feel of that Spider in my hands. Times like this call for some comfort and that usually means cake ….don’t you think? 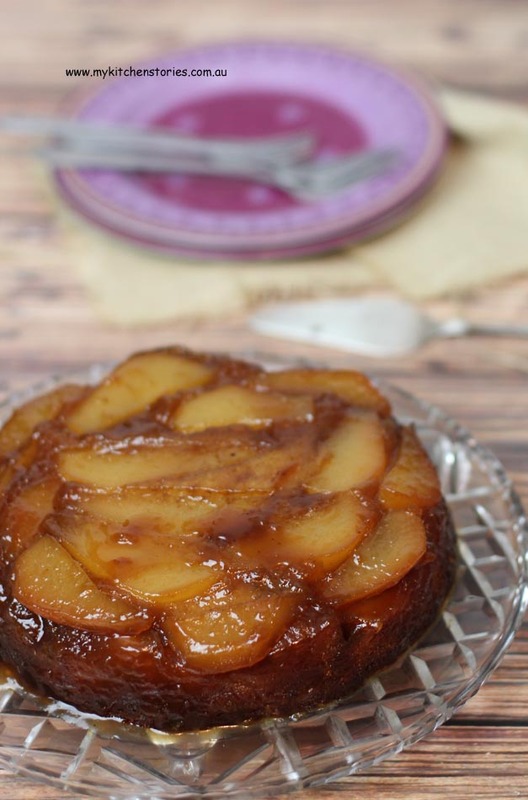 This cake is not only made with beer and pears it’s comfortably caramel with a touch of salt added. It will cure just about anything except inflamed ligaments it seems. Why don’t you make it and see if it can fix you. 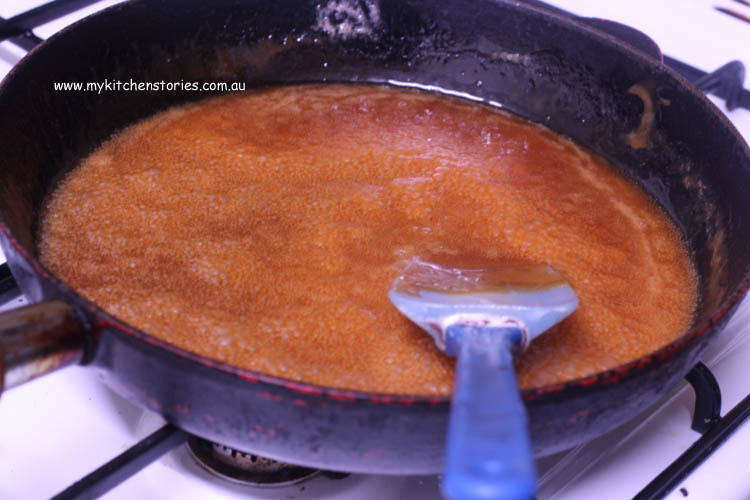 Put the butter, sugar, lemon juice and beer in to a wide bottomed pot and bring to a simmer. Boil over medium to high heat till it starts to turn golden brown. Make sure it is a nice brown colour before adding the 1/2 cup of water. stir and bring back to the boil before taking off the heat and adding the salt, stir well. Pour enough of the caramel over the pears to cover, you probably wont need all of it . Set aside. Mix the dry ingredients, then add the beer, melted butter, egg and buttermilk and mix well. Pour the batter over the caramel and smooth down. Bake for around 50 minutes or until a skewer inserted into the middle comes out clean. Let the cake sit for 5-10 minutes after you take it out of the oven. Run a sharp knife around the edge carefully and remove removable side of the cake tin. . Turn the cake over onto a plate and remove the cake base, then peel off the baking paper. My second and third attempt were amazing. Wow, some of my very favorite ingredients in one cake – it looks beautiful! I think I would have bought a 2-litre bottle of beer, used the 1/4 cup for the recipe and drank the rest while the cake was baking. I HATE spiders. or anything that’s wiggly. 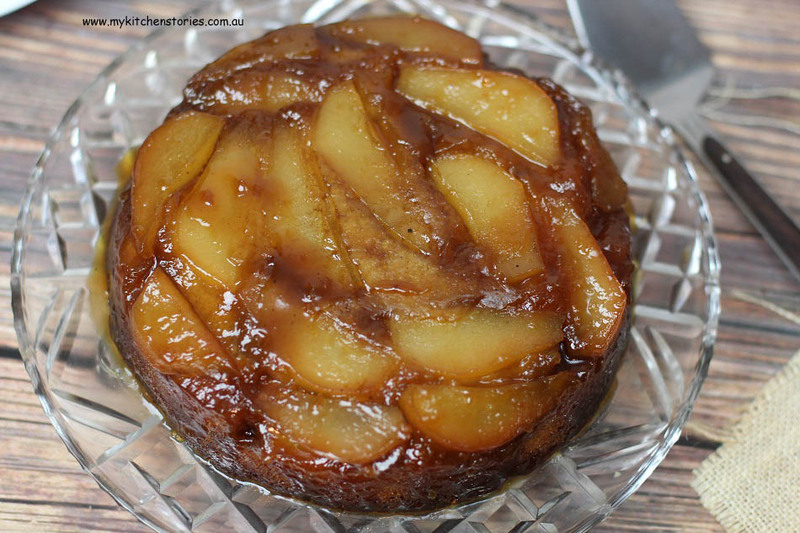 This cake looks perfect,my kind of cake with stcky pears. Now go and get that frozen shoulder treated. Physios can teach you some great exercises. Poor spider! Oh you poor thing you Tania! I hope your shoulder OK, do you know what the problem is? Creepy crawlies really are the worst- I had to go to the doctor last week as a creature crawled right down into my ear drum while I was sleeping and he had to aggressively flush it out!! It was definitely one of the most revolting experiences EVER! Poor you! I don’t like spiders either (or snakes)…and I grew up in the country! The cake sounds yummy and I think I would probably drink the rest of the beer too – especially after the spider incident! That experience calls for a LOT of cake. I absolutely hate walking into spiders webs – I am never sure if the spider is on me or not and really am reduced to a state of panic. It is awful! Your experience with the spider on you, your arm in agony and the massive web sounds just horrible. This cake, however, does sound like the thing to help. Oh god, I hope you feel a lot better! That sounds so painful! Spiders… oh god I can’t even, I go to major lengths to avoid them! Hope you ate lots of this lovely cake (with the remaining beer of course!) to calm yourself! Choc Chip Uru recently posted..Tell Me About JAG Australia? Oh, I’d need something after an experience like that. This cake sounds perfect. Take care of that arm! Bad shoulders can be so debilitating. We forget how much we use our arms, how much we move them until there is something wrong. Stay well, and stay away from the spiders! 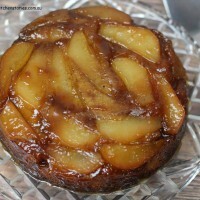 o my..those sticky caramelized pears…heavenly! We’ll be trying this one out for sure!! Looks delicious! That looks amazing, and combines some of my favourite flavours! Yummo! Hope your shoulder is on the improve soon and you recover from the spider incident! That spider encounter sounds positively horrifying! I had a cockroach fall onto my head when I was in the shower once (we lived in Africa then) and I think I’m still scarred from the experience lol. I hope your shoulder improves soon though! Hopefully this beautiful cake helped! That cake looks unbelievably good. Upside-down cakes are the best. What an absolutely marvellous cake! Love it! I hate spiders too… I thought it was summer already. The cake looks incredibly rich and delicious! Hope your shoulder gets better soon, Tania. omg that spider story sounds traumatising. I’ve still got goosebumps from reading it. The cake, on the other hand, looks fantastic! Love a good shiny glaze, and those pears look luscious.